One of the most recognisable structures in Paris, the cathedral of Notre Dame not only contains a great deal of artwork within it, but has also inspired artists who have come to Paris since its completion in the 1200s. Depictions of Notre Dame chart nearly a millennium of Parisian history, from its medieval origins, to its sweeping revolutions and focal position within the development of Modern art. In remembrance of the building's enduring place within the cultural depictions of the city and the hearts and minds of its residents, here are some of the most significant works of art inspired by Notre Dame. As representatives of ancient monarchical rule in France, each of the limestone kings which decorated the Notre-Dame cathedral’s portals were destroyed during the French Revolution. 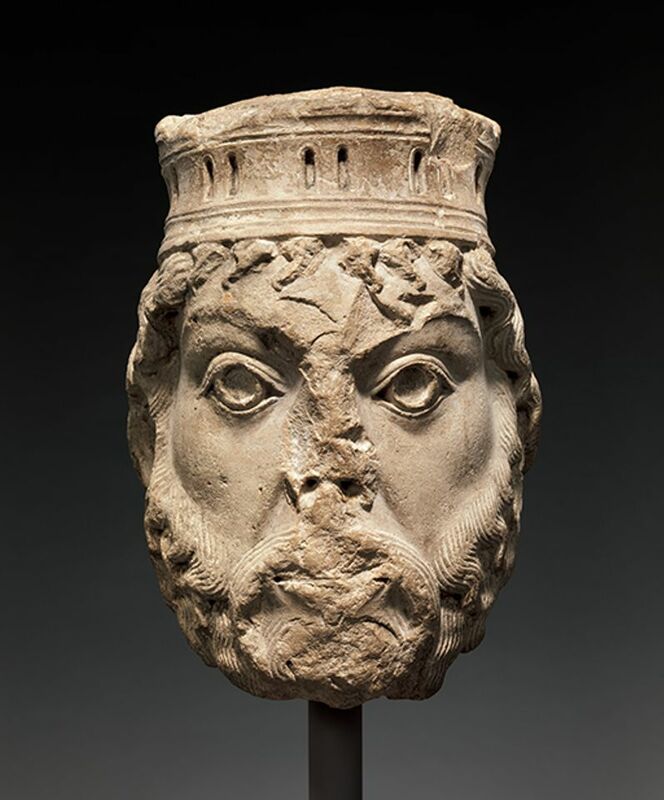 This head, severed from its body in front of cheering crowds, depicts King David, who was regarded as an ancestor of Jesus. This work was the only known surviving king’s head from the cathedral until a discovery in 1977 which found 21 of the figures hidden in a basement beneath Paris’ Bank of Foreign Trade. 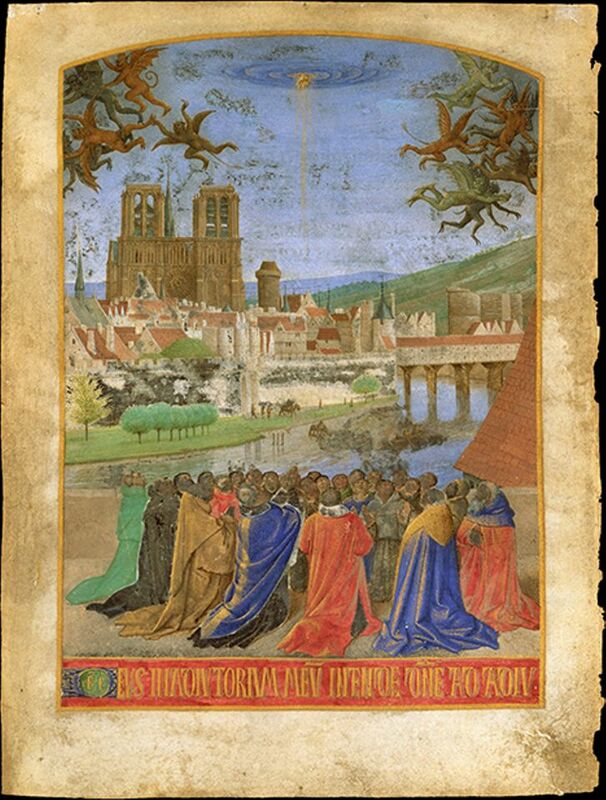 Taken from The Hours of Étienne Chevalier, a lavish illuminated manuscript painted in fifteenth century France, it depicts It shows the faithful Christians looking up at the hand of God, as demons flee to the left and right. This tempera and gold leaf parchment work is one of the earliest topographically accurate views of medieval Paris. Immediately recognisable alongside Notre Dame are the spire of Saint-Chapelle, the Pont Saint-Michel, and other monuments of the Île de la Cité. The cathedral has played host to many pivotal moment’s in France’s history, including the crowning of Napoleon I as Emperor of the French in 1804. 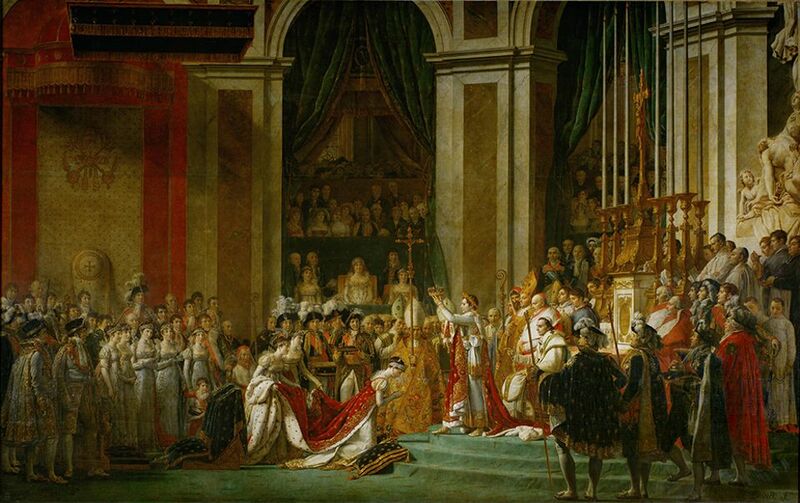 Realised by Bonaparte’s official painter David, it shows Napoleon dressed in robes similar to those of a Roman emperor, holding a crown above his head as though anointing himself. Enormous in stature (measuring 10 meters wide), it exposes both the grandeur of the Cathedral’s interior and Napoleon’s imperial ambition. Atget’s oeuvre found a fixation in creating what he termed “documents” of the city and its surroundings, compiling a visual compendium of the architecture, landscape, and artefacts which best represented French history and culture. In his old age, however, he worked more for his own pleasure and during the last five years of his life photographed Notre Dame regularly. 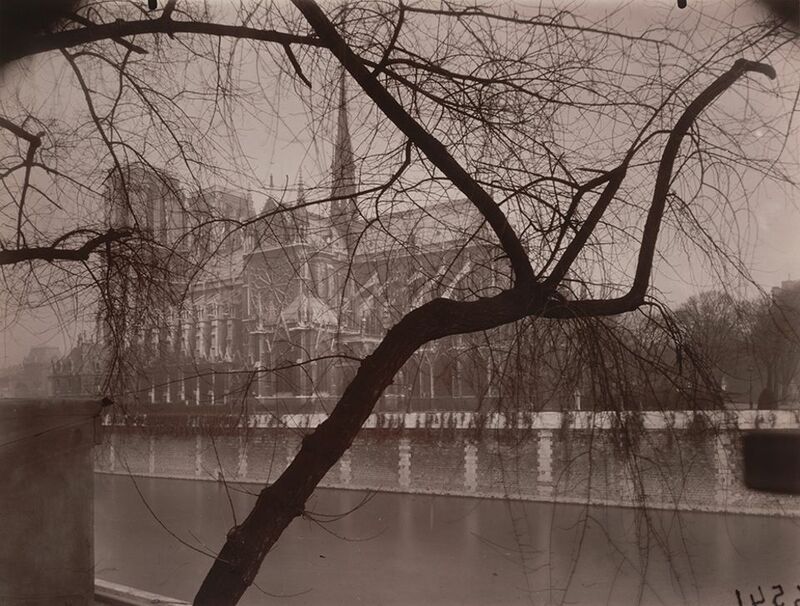 Atget’s photography of the cathedral always zooms in on details of the building’s facade, or views it from at unusual angles in the distance, as seen here. 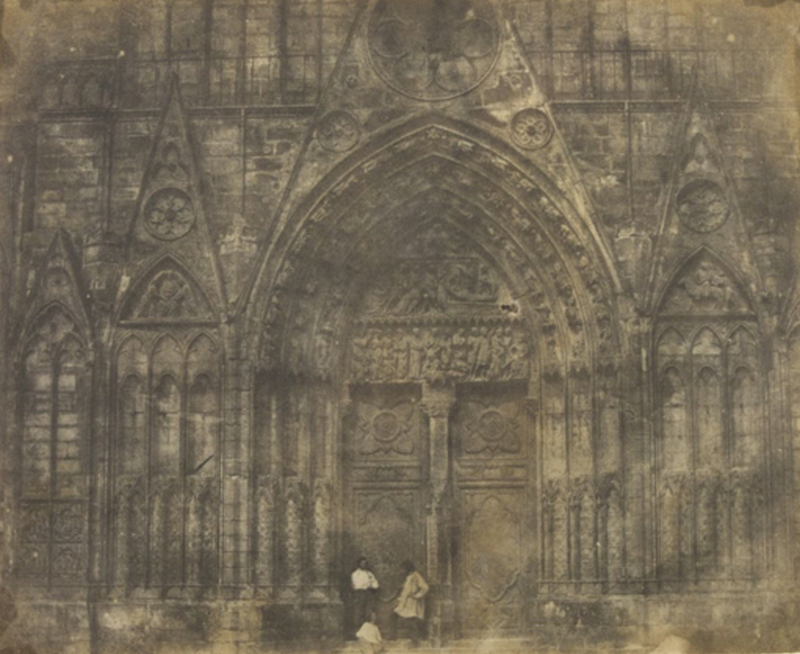 This photo of the cathedral’s side portal is an example of the calotype, a method of early photography developed alongside the daguerreotype, which used paper coated with silver iodide and focused on the quality of image and smoothness of surface. Taken before the beginning of the 1844 restoration, it is an example of the paper photographs of France’s great monuments which Bassano pioneered in the mid 19th century. 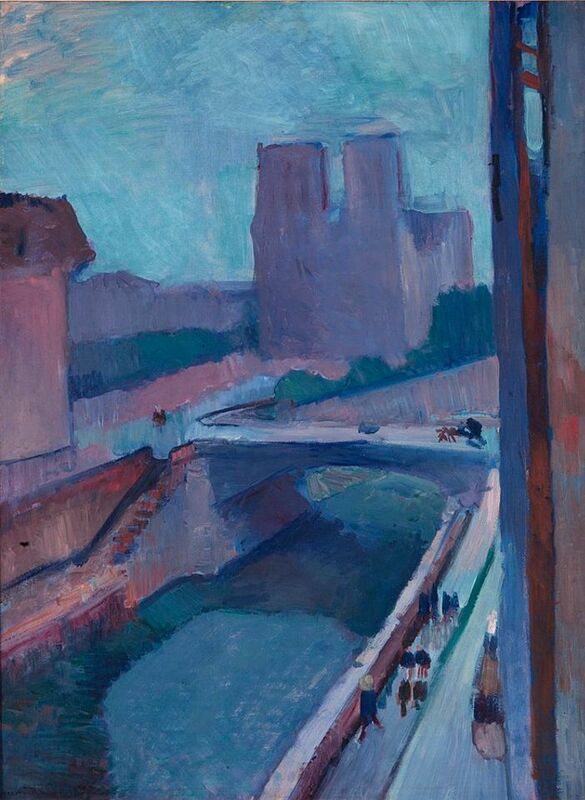 This glimpse of Notre Dame is a view from Matisse’s apartment and studio in Paris, where he was living and working from 1899-1907. He returned to the same vantage point throughout his career, approaching it form various different styles. 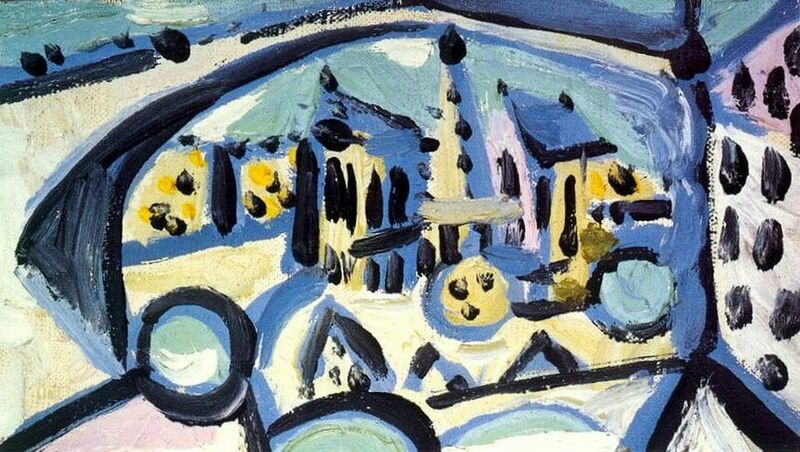 Matisse painted this piece during his so-called Dark Period, a time of personal difficulties when the artist worked with mostly sombre shades. Today, the painting is in the collection of the Albright-Knox Art Gallery in Buffalo, New York. Picasso tackled the scenes of Paris throughout his life, particularly focussing on bending the buildings, the bridges and the river into the Cubist style that he pioneered. This piece painted after the Second World War, captures the Notre Dame in a softer and looser style in muted pastel colours, possibly reflecting a lighter mood after the liberation of the city. 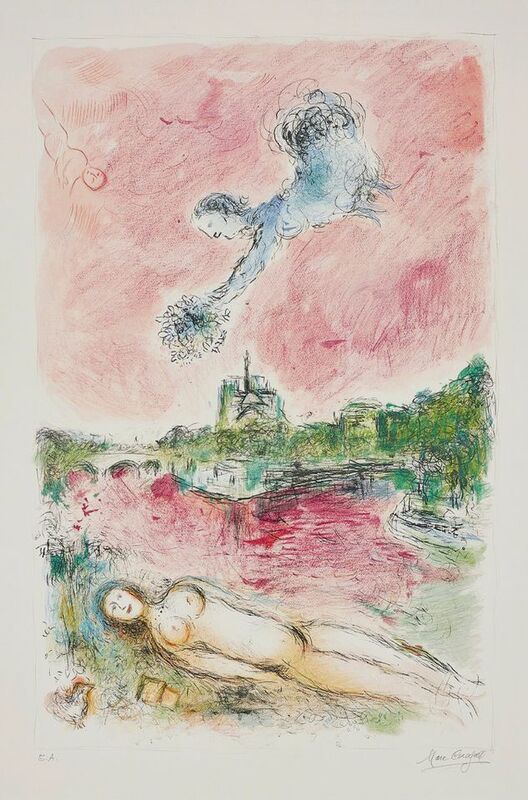 “Paris!” Marc Chagall wrote in his autobiography, “No word sounded sweeter to me!” Arriving in the city for the first time in 1910, the Belorussian-born artist was deeply affected by the French capital and settled in the country permanently in 1948. He captured many views of Paris, including Notre Dame, throughout his career in his signature fantastical style, incorporating mythical monsters and mystical figures in colourful swirls of paint. In this image, the famous cathedral appears at the centre between a floating creature offering a bouquet down to female character laying on the banks of the Seine. 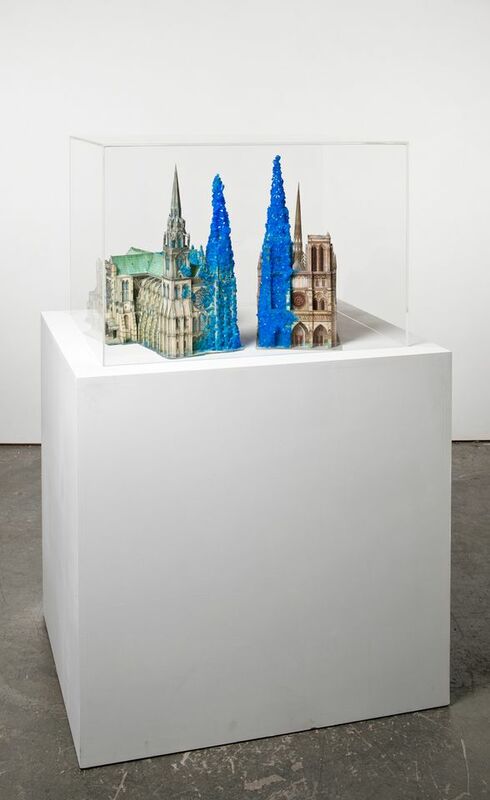 Although not the most famous work of art inspired by Notre Dame, Roger Hiorns's sculpture of the cathedral (on the right of the image) deserves an honourable mention for prescience alone—the model is covered in copper sulphate crystals, engulfing the building much in the way the fire has done. For Hiorns, the act of growing these synthetic crystals is a reflection on the unpredictability and fragility of life and art—a poignant thought when considering Notre Dame's eventual fate. Kaleidoscope-inspired imagery has long-inspired Damien Hirst, and he made his first “Kaleidoscope” painting It’s a Wonderful World in 2001. Made out of thousands of butterflies and paint, the pattern was taken from an old Victorian tea tray. 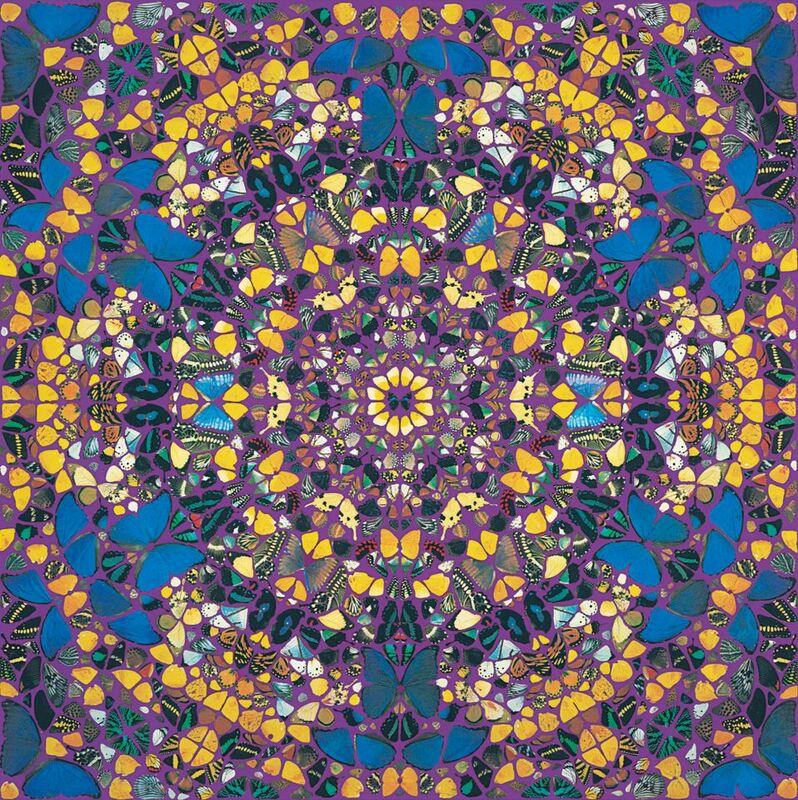 The Kaleidoscope works reference the spiritual symbolism of the butterfly and this later led Hirst to start copying stain glass windows in churches, including this one inspired by Notre Dame.